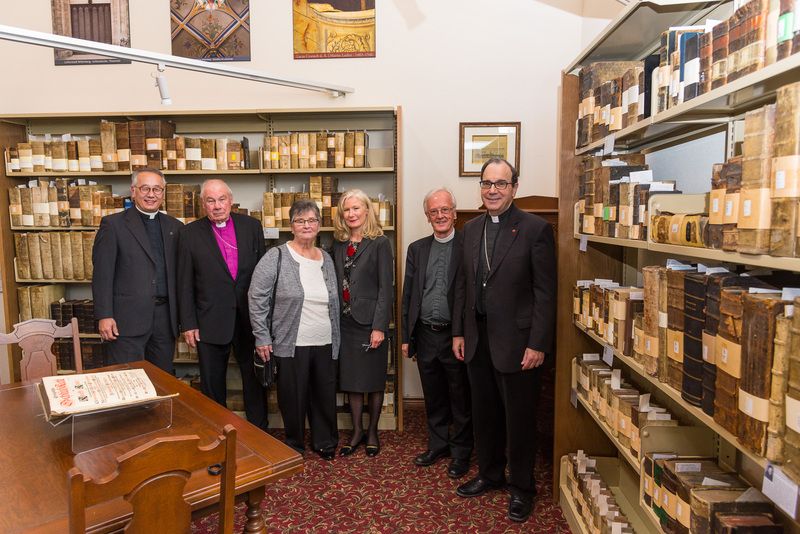 The Reformation Rare Book Room has officially opened at Concordia Lutheran Theological Seminary in St. Catharines. The special room, built to mark the 500th anniversary of the Reformation, houses the library’s oldest books, dating from the 16th, 17th and 18th centuries. Lutheran Church–Canada President, Dr. Robert Bugbee, was on hand to cut the ribbon and bless the library’s newest space. From l to r: Dr Naomichi Masaki (Concordia, Fort Wayne), Bishop Jobst Schöne (SELK, Germany), Judy Zastrow (Seminary Guild President), Sarah Cavanagh (Library), Dr. John Stephenson (Director of the Library) join LCC President Robert Bugbee at the opening. Close to 300 volumes are featured in the rare book room, most written in old German Fraktur script, some in Latin, and a few in English. The books range from biblical commentaries, language lexicons, theological and philosophical tracts and devotional writings. Several editions of Martin Luther’s writings are represented in the collection, including the oldest book owned by the library, Volume 8 of the Jena edition of Luther’s Werke, published in Germany in 1562. Bibliophiles will be interested to see first-hand examples of printing styles and bookmaking techniques from this period. Some of the volumes feature ornate brass clasps and bindings, tooled and embossed leather covers, as well as woodcut and wood engraved illustrations. 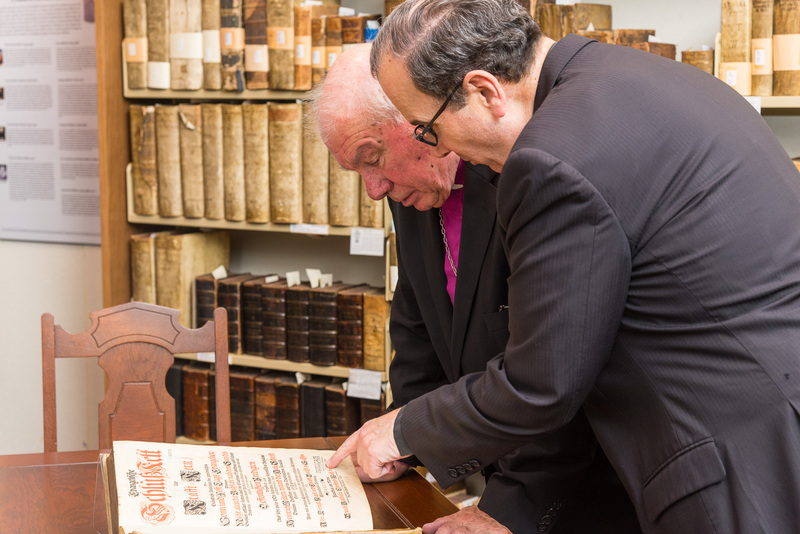 As Dr. John Stephenson, Director of the Library, states: “Material for a goodly number of doctoral treatises is lurking among the contents of our Reformation Rare Book Room.” History classes from Brock University, the seminary’s affiliated degree-granting institution, have already visited the space. The room was, in part, generously funded by the Concordia Seminary Guild, an auxiliary group which supports seminary operations and its students. Detailed bibliographic information on each rare book volume is available in the online library catalogue, which can be accessed from the seminary website. An alphabetical list of the Reformation-era authors represented in the collection is also on the library page. Access to the rare book room is strictly limited and supervised. Visitors are welcome, but encouraged to contact the library in advance.